The following tale, originally posted on June 21st, 2011 at 2:30 AM, is not accurate. Read the update at the end of this post for more details. However, I know multiple sources linked to this piece, so I shall let it live. Occasionally, a sensation will take the Nation of Phils tweeters by storm. This past weekend, it was the move by Phillies right-handed reliever Mike Stutes to join the online Tweetfest. Interestingly, Stutes had a bit of a wager going when he decided to create his own Twitter account last Friday. Scott Mathieson, who has pitched in relief for the Phillies this season but is currently settling into the role of starter for the first time in four years with the Triple A Lehigh Valley IronPigs, felt that Stutes could not collect 1,000 followers on the social networking site within the first 24 hours. Not only did Stutes exceed the 1,000 mark, but he more than doubled that goal after a single day. Mathieson, who last week had to watch his hometown Vancouver Canucks drop game 7 of the Stanley Cup Finals to the Boston Bruins, was then required to dress like the folks he wished heart breaking defeat upon, wearing a hockey sweater for the team that any British Columbia native should want nothing to do with. 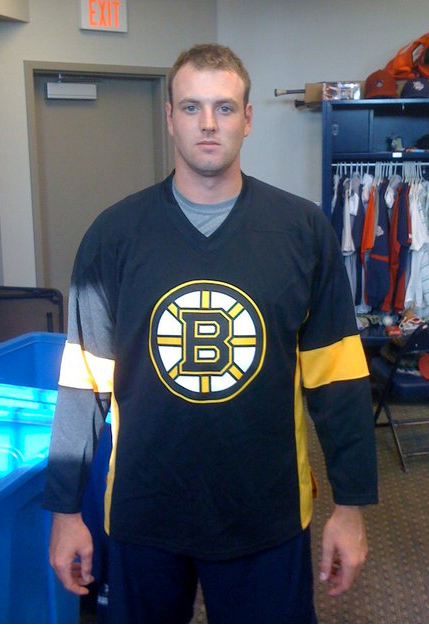 The above image of Mathieson sporting a Bruins jersey must now reside as his own personal Facebook profile picture for one full week. 1- Don't mess with Mike Stutes. 2- If you somehow aren't on Twitter, get to it, because you are missing cool stuff. **11:49 AM update- After speaking with Scott Mathieson today, I learned that he never actually had a bet with Stutes or Mike Schwimer regarding anyone's Twitter following. The actual bet was with the IronPigs' head grounds crew guy, Bill, that if the Canucks lost, Mathieson would don the enemy garb on for his Facebook profile. Mathieson claims to have no interest in Twitter and has never had any wager with Stutes or any other player about his army of followers. Follow Mike Stutes on Twitter by clicking HERE. Schwimer tweeted that he made the Stutes-won't-get-1000-followers bet with Matheison, and it was for personal pride only.